Nvidia presentation slides have surfaced suggesting that the new GeForce RTX 2080 will be around 50 percent faster in current gaming workloads than the GeForce GTX 1080. Officially revealed yesterday, the RTX 2000 series cards use the new Turing GPU that features onboard Tensor and RT cores for accelerated processing of AI and ray tracing workloads respectively, in addition to the regular set of CUDA cores that handle shader workloads. In his keynote introducing said series, Nvidia CEO and founder Jensen Huang focussed heavily on how much better the new generation of cards were in AI and ray tracing workloads. This makes for some impressive numbers, especially in newly crafted metrics like Giga Rays and RTX-OPS, but it’s wholly unsurprising given the lack of dedicated hardware in previous parts. As such, the question on many people’s lips has understandably been how the new cards are likely to perform in like-for-like comparisons, i.e. in current-generation games that have no means of leveraging the new AI or ray tracing capabilities. 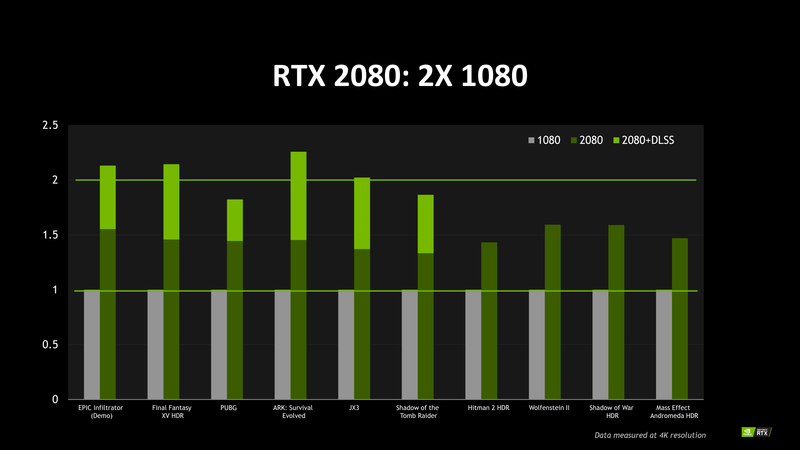 Today, Nvidia has leaked an internal presentation slide demonstrating the performance of the RTX 2080 in a series of just such games relative to the GTX 1080, and the main message appears to be that the former can offer somewhere in the region of 50 percent more performance. 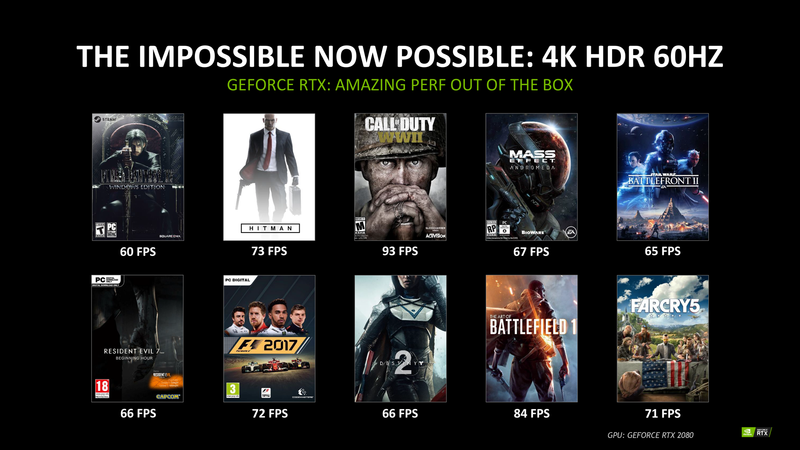 A second slide provides FPS counts in another selection of games running at 4K (3,840 x 2,160), and the messaging here is that the RTX 2080 is capable of delivering average frame rates of 60fps or more in modern AAA titles, though the settings used in each game have not been disclosed. Naturally, the claim of ‘1.5x perf with AA’ should be taken with a pinch of salt – these are in-house benchmarks without independent verification, and seven of the 10 titles shown are actually below the 50 percent line. Nonetheless, it is at least the first hint of how we can expect the new cards to perform, and should put the RTX 2080 roughly on a level with a GTX 1080 Ti or possibly a bit higher. If you are wondering what the DLSS means in the phrase ‘2x perf with DLSS’ refers to, you can read Nvidia's own words: 'Powered by Turing’s Tensor Cores, which perform lightning-fast deep neural network processing, GeForce RTX GPUs also support Deep Learning Super-Sampling (DLSS), a technology that applies deep learning and AI to rendering techniques, resulting in crisp, smooth edges on rendered objects in games.' Clearly, then, it's an AI-enhanced anti-aliasing method which leverages the new Tensor cores specifically, and thus is not a true like-for-like comparison when it comes to RTX 2080 versus GTX 1080. It’s also worth remembering that these are rather different cards under the hood; the RTX 2080 has similar clock speeds to a GTX 1080, but it benefits from 15 percent more CUDA cores to (2,944 versus 2,560) and a 40 percent improvement in memory bandwidth (14Gbps versus 10Gbps). Lastly, the two cards are pretty far apart price-wise; a GTX 1080 starts at about £500 now while the starting pre-order price for RTX 2080 models is about £715, meaning the 1.5x performance claim is pretty much borne out as far as pricing goes. Also headphones, for some reason.